Yes, absolutely! It is just natural as we are friends, we work together and we also spend so much time together. Sometimes we are not even sure what pieces belong to whom. Yet, some pieces are really specific and personal to each of us. Who or what are you influenced by in fashion? Any style icons? Style and beauty are everywhere if you really pay attention. For us, inspiration comes from our everyday life. There are no rules or specific people. It can be an old lady at cafe or children playing on the street, a scene in a movie or something unusual with a look… something like a scarf worn randomly on the head to avoid the cold. Those unexpected twists are pure gold when it comes to inspiration. You guys always have the most amazing vintage! Any hidden gems you can tell us about? What is most important to you: comfort, beauty, or innovation? There are a lot of beauty interpretations. Honestly we like our “woman” to feel unique in a very genuine way and confident in a natural and non-aggressive way. She needs to be comfortable enough to forget what she is wearing and be able to feel herself, the same way a child or an old person does. For us, innovation is subtle and it comes by modernizing traditional techniques. Of course, this is impossible to avoid when creating, as it is vital in the creative process of any designer. How does your brand represent your own values and personal style? We are firm believers of treasuring pieces that you really love. We avoid the idea of fast fashion and extreme changes from one collection to another. For example, we tend to keep the same pieces in our wardrobe and wear them over and over again. This is only possible when you buy in a conscious way, when you choose quality over fast trends. We aim to create clothes that our daughters would be able to wear 20 years from now. We invest a lot of time researching for techniques and fabrics, thinking about the craftsmanship and the love involved on behalf of our production team. All our pieces are 100% made in Italy. People always think about glamour when they imagine a designer’s life, but the truth is that we are spending around 80% of our time in Tuscany with our artisans. We spend literally more time with them than with our own family :) We are constantly enriched by our dialogue with them. This is actually one of the most important parts of our work, and we are lucky to have found amazing people that have became real friends now. 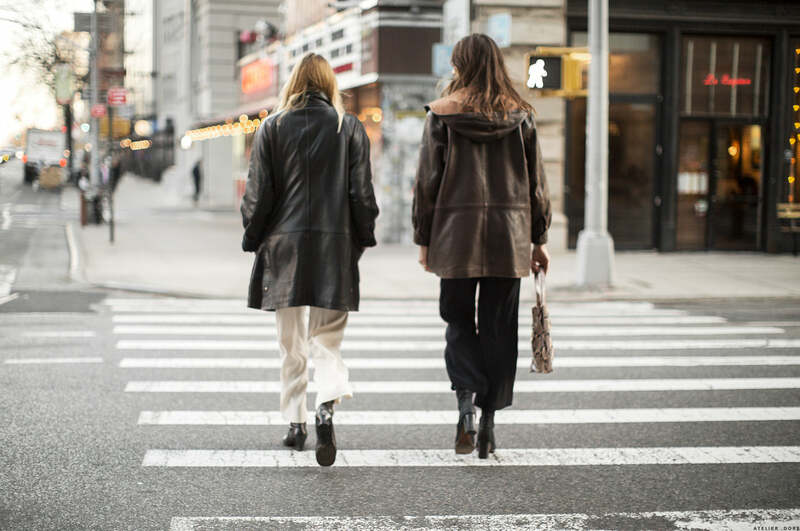 Tine and Luisa are the super stylish designers behind TL-180 handbags. You can shop them here. They’ve been longtime friends of the site (going back over eight years!) and we couldn’t be more excited to catch up with them again! On partage tellement avec ses amies que l’on finit par se ressembler ! Super style : vintage ?